Why Every Community Can Benefit From A Local “In Search Of HEROES Program”! “Rise up HEROES and Heroines! The world needs you NOW!” This is the motto of the “In Search Of HEROES Program”. Everyone benefits when these questions are answered by students, teachers and parents. One of the primary goals of the “In Search Of HEROES Program” is for students to realize their parents, teachers, neighbors, friends, family members, coaches, spiritual and community service leaders are the real HEROES. These individuals are the unsung HEROES of our world. They are HEROES who (H)elp (E)nthusiastically, (R)esponsibly, (O)ptimistically (E)xceptionally (S)ocially and/or (S)piritually. Young people benefit when they realize professional athletes, musicians and movie stars may not be the best role models. 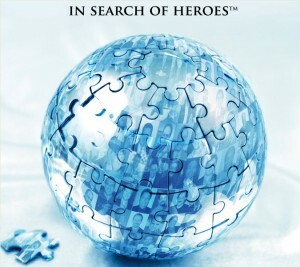 The “In Search Of HEROES Program” promotes good news by focusing on positive and uplifting ideas, actions and activities. Good news, a positive attitude, heroic role models and adequate preparedness counter the harmful effects of FEAR. Many people are afraid! Wars, threats of war, terrorism, killer plagues, famine, starvation, poverty, financial catastrophe and violence have a negative impact on every family and society. 1. Mind-mapping software that stores files in your Google Drive folder. It transforms information into a format that is easy for people to understand. Colorful mind-maps use words, colors, symbols and pictures to provide a brain-integrated overview. 2. Google Slides that uses words, pictures, movies, charts and animation to create slide shows that provide more detail in a form that appeals to whole brain processing. 3. Google Docs that creates outlines that are detailed and very specific with information that appeals to the linear, word-focused left brain. 4. Google Sheets, a spreadsheet online software, that helps them keep track of the entire program in their community. 5. Google Calendar that helps you keep track of your schedule of events and interviews. 7. Google Gmail that you with email services and Google Drive storage. 8. Also, the benefits of using Google Apps for Educational instructions and non-profits will be explored. 9. Hootsuite that allows you to automate the dissemination of your online work to three of your social media sites. The “In Search Of HEROES Program” generates income to fund the program, activities, equipment, software, training and travel through viral marketing and existing affiliate programs of major companies.